Summary : I'll be honest. I think I prefer "flavored" Rooibos Teas, such as Orange Rooibos Tea, over the "straight kind." Yet, for a pure rooibos tea, this is a very good tea with a pleasant taste. If you like "straight" rooibos teas, you will most definitely enjoy this one. Review : I've really come to like the tea that originates from South Africa, which is, of course, rooibos tea. 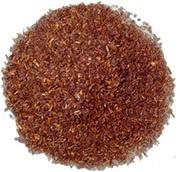 Unlike teas from Asia, rooibos teas are usually red and are not a "true tea," since a completely different plant is used to make this tea. Rooibos tea first surged to popularity during WWII, when the British, finding all the normal tea supply areas under Japanese control, got their tea fixation through this plant of South Africa instead. Despite all the rooibos teas I've tried so far, oddly enough, I had yet to try a "pure", or unflavored/uninfused, rooibos tea. So I rather looked forward to tasting the pure rooibos tea that I ordered from Culinary Teas. The tea, straight out of the package that it is bundled in, most definitely smells like a Rooibos Tea. The fragrance is not overpowering, since nothing has been infused into the tea. Here is what Culinary Teas says about this tea: "This is the superior grade of Rooibos from the Cedarburg region of South Africa. A reddish herbal tea with sweet flavor notes." I decided to try this tea two ways. The first cup was "straight up," with nothing added. The second cup I added milk to the tea, just to see what happens. Somewhat surprisingly, the tea basically tasted the same either way - and I added a LOT of milk to the second cup! Rooibos tea does have a pretty powerful taste to it, and it just overpowered the milk that got added. After drinking this pure rooibos tea, I've come to the sad conclusion that I do prefer flavored versions better. Perhaps the rooibos tea taste is just "too strong?" Whatever it is, I will take a flavored rooibos tea over the straight version...for better or for worse. Overall, if you enjoy the taste of "straight up" rooibos teas, you'll definitely enjoy this one. The tea has a very strong rooibos flavor that will overwhelm virtually anything you put into it. And the leaves are top-quality too. Recommendation : Yes. If pure rooibos teas are your thing, you'll love this tea. For such tea drinkers, I would rate this tea a 4 or perhaps even a 5 star tea. Yet, I personally enjoy "flavored rooibos teas," and I did not totally enjoy this particular one...hence I give it three stars since it is by no means my favorite tea in my ever expanding collection. Rooibos Orange Tea from Adagio Teas : A tea that, at long last, really does taste like oranges!